Let pie crusts come to room temperature while you prepare the pork. 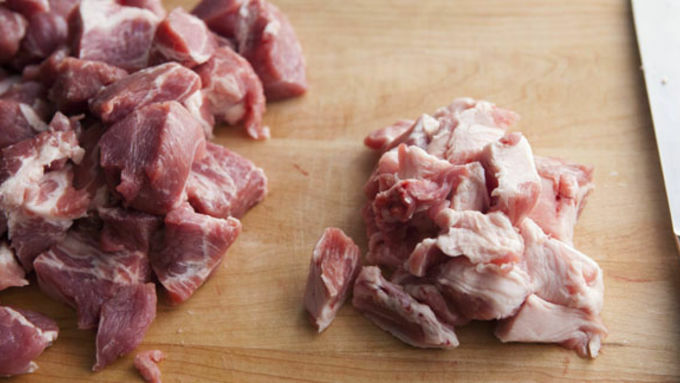 Chop boneless pork into small 1/4-inch cubes and try to separate out any large chunks of fat. Preheat oven to 400°F. 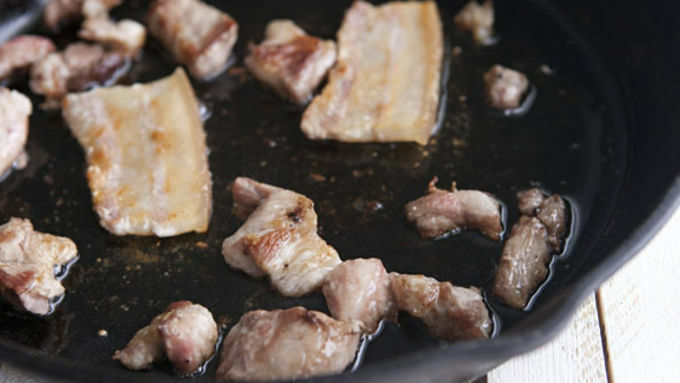 Add fat pieces of pork (hopefully 6-8 ounces) and bacon to a large cast iron skillet over low heat. Cook for 15 minutes until the fat is rendered out of the pork. Remove fat pieces and bacon from pan leaving the fat in the pan. Turn heat on pan up to medium-high heat. 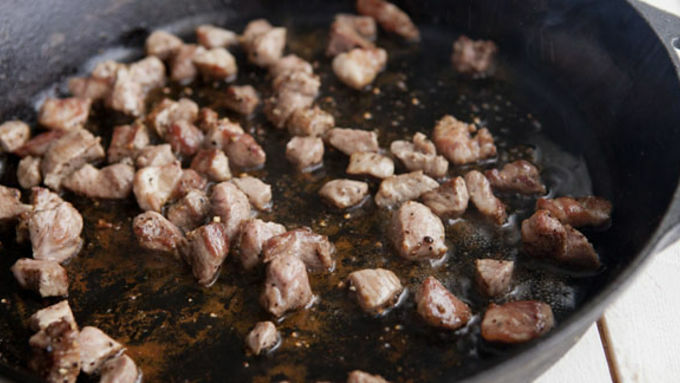 Season lean pieces of pork with a big pinch of salt and pepper and add to skillet. Brown pork well on all sides cooking for about 5-6 minutes. Remove lean pork pieces and let cool briefly. Remove pan from heat, but don't wash it. Working with one pie crust at a time, ball it up and cut off 1/4 of the dough. 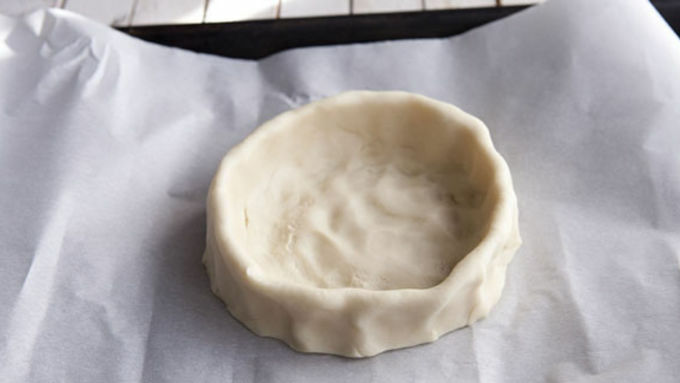 Place the 3/4 piece of dough on some parchment paper and roll it into a 5-6 inch circle. Shape it into a bowl that has edges about 1-2 inches high. 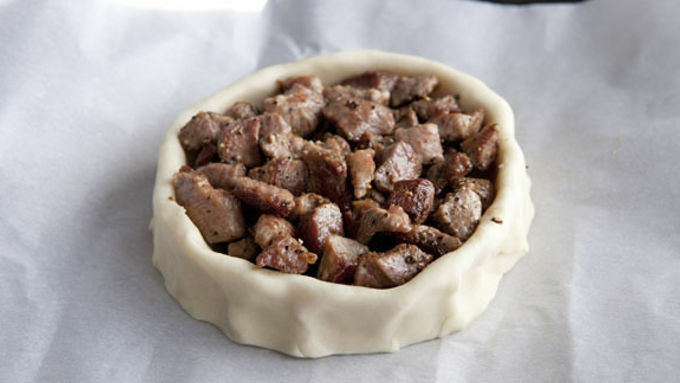 Add 8-10 ounces of browned pork to the crust bowl. You can really pack the pork in the bowl. Roll out the 1/4 piece of dough and cover bowl with the crust. Brush with whisked egg and cut a hole in the center to let steam escape. Repeat with other pie crust and then bake pork pies at 400°F for 10 minutes. Reduce heat to 325°F and bake for another hour. Remove pies from the oven and let cool. Meanwhile, reheat pan that you browned the pork in over low heat. Once hot, stir in flour and cook for 30 seconds. Then add beef stock and stir until it comes together in a light gravy. 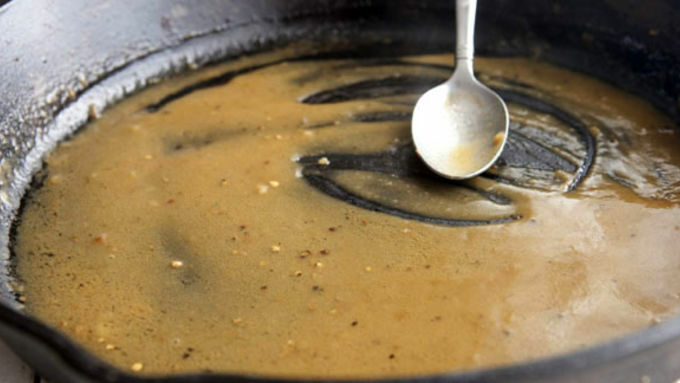 Serve gravy with pork pies while warm. 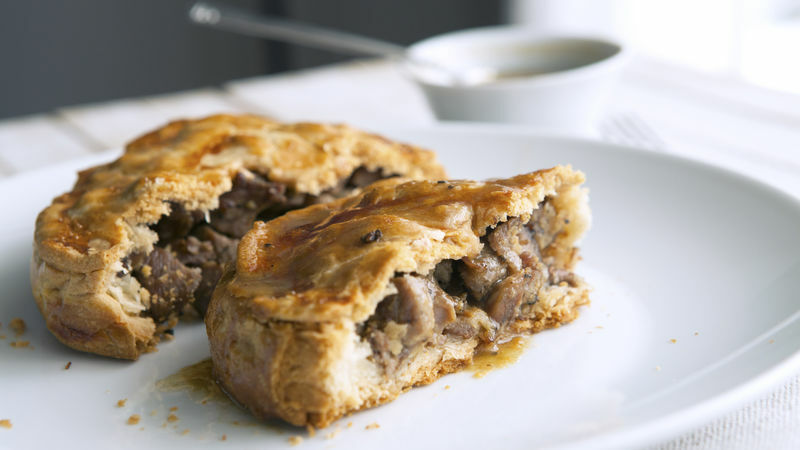 Melton Mowbray Pork Pie – what a mouthful. A mouthful of deliciousness, that is! Sometimes when I’m reading a fantasy book, I like to think what I would cook in that world. For books like The Hobbit, the answer is pretty easy since the characters focus so much on food! I would like to think that Frodo and Bilbo would happily pull a chair up to my table if these pork pies were in the oven! 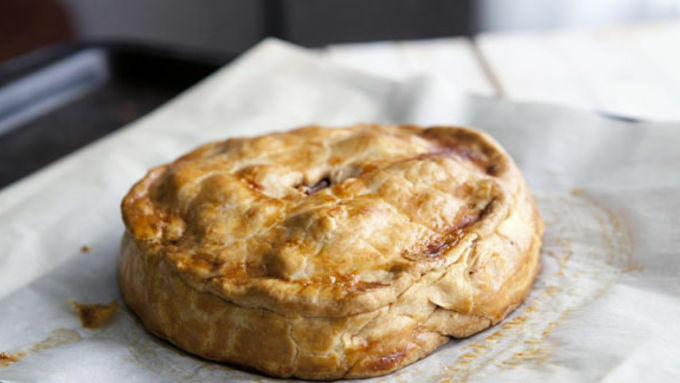 These pies are based on a classic British pork pie that is very involved to make. It requires baking and cooling and making an aspic out of boiled pork bones. I used a shortcut method, but the results are still delicious! There aren't a lot of ingredients in this recipe, but it’s all about execution. For your pork you can use boneless ribs or shoulder and cut it into chunks. Try to split the pork into fatty pieces and lean pieces. The fat pieces are important to make the gravy, but we’ll only use the lean pieces in the pie so it isn’t too fatty. 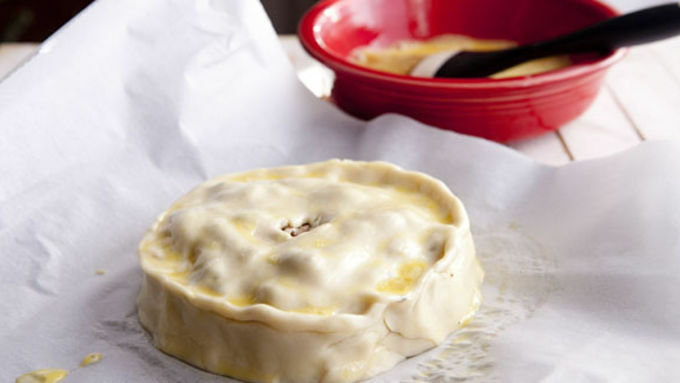 You could make the pastry from scratch, or refrigerated pie crust works too. While the original version of this recipe actually calls for piping the gravy (or aspic) into the pies, I like to just serve it on the side so people can add it as they like. This is a totally filling dinner and if you serve it with a salad or something, one pie can easily feed two people. Or one very hungry hobbit.